Let me begin by saying I love this soup. Granted, I am a soup lover, but this is one I always look forward to. 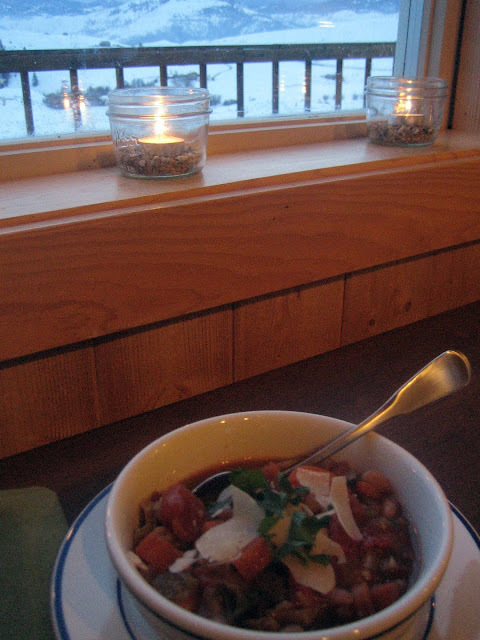 After a day spent in the snow, a fragrant bowl of White Bean and Vegetable Soup is enticing and draws us back inside. Soup warms you in a deeply satisfying way, much like sinking into a soft, hand-knit sweater does. What attracts me to this soup in particular is its star ingredient, balsamic vinegar. There are so many ways to love balsamic vinegar (I now have a love affair going with caramelized balsamic vinegar since discovering it in Australia). Here, balsamic vinegar adds incredible richness and flavor to the mélange of white beans, tomatoes and veggies. It’s a terrific soup for whatever is in the fridge – any diced root vegetables such as rutabagas, Yukon Gold potatoes, sweet potatoes or parsnips can be added. A handful of green beans tossed in with some fresh dill would change up the flavors nicely. 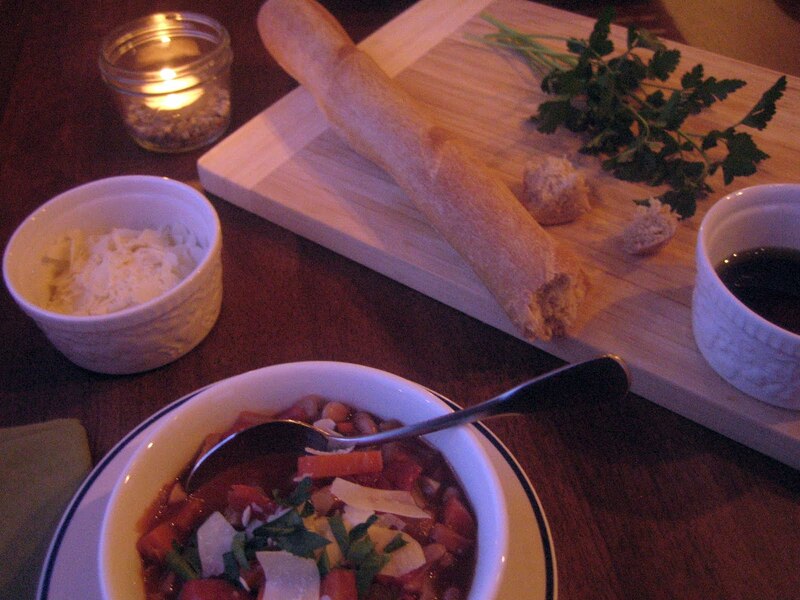 The key here is the combination of balsamic vinegar, tomatoes and red wine which creates a luscious basis for the soup. I don’t usually measure the balsamic vinegar - I tend to start with a few splashes and taste from there to see how it mixes and infuses with the rest of the ingredients. Light some candles, grate some Parmesan, warm a crusty baguette and you’ll have a lovely winter supper to share with friends. In a Dutch oven or large soup pot, warm a few tablespoons of olive oil over medium heat. Add the onions and sauté until they start softening, about 5 minutes. Add the garlic, celery and carrots and give the vegetables a stir. Cook until they begin softening, about 10 minutes. Add another few tablespoons of olive oil if the mixture seems dry. Toss in the cabbage and continue cooking for a few more minutes, scraping up any browned bits from the bottom of the pan. Stir in the vegetable broth, white beans, tomatoes, tomato paste and red wine. Add a few splashes of balsamic vinegar, a sprinkle of kosher salt and a few grinds of pepper. Cook until the broth begins to bubble up a bit, then turn the heat down to low, partially cover the pot and let simmer for about an hour. Check the soup a few times to stir it, taste for salt, pepper and balsamic vinegar and to see if the veggies are softened. Towards the end of cooking, stir in the parsley and a few shakes of crushed red chile peppers if desired. The soup can be made a day ahead or earlier in the morning and reheated before serving (it improves if given some time to sit). 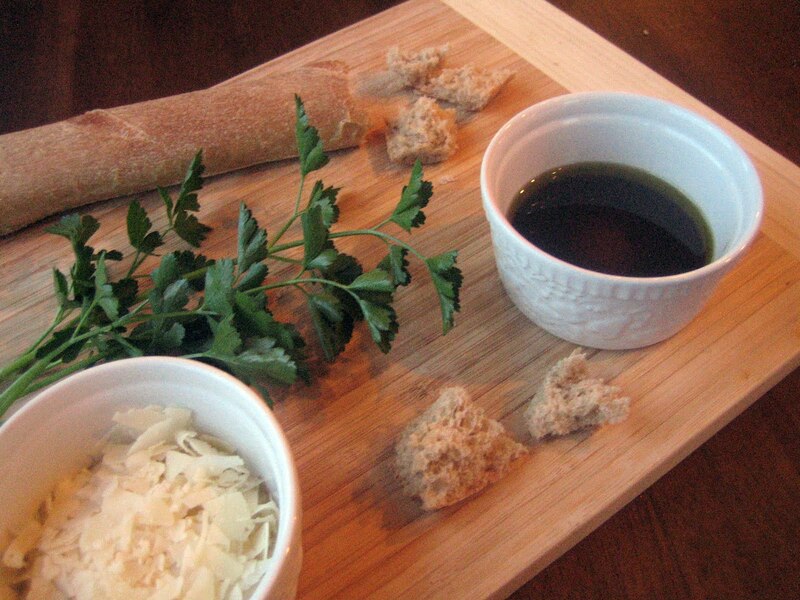 Serve with Parmesan cheese and additional olive oil and balsamic vinegar for drizzling. Dip crusty hunks of baguette in to the soup and enjoy. As I was reading your post, I was already thinking I had to try this soup right away. Then I got to the recipe and realized I have all of the ingredients already. Don't you love it when that happens? I do love it, Rowdy Chowgirl! Hope you enjoy it - have a great weekend! Such a great recipe, Hannah, for a cool winter evening. I just spoke to my daughter, who lives in Seattle, she told me it's chilly. Perfect soup for the weather. Thank you, Marina! Our chilly, rainy winter is continuing...hopefully we can look forward to spring soon. That looks really filling and tasty. Balsamic sounds like it adds a tang to it....mmmm! We still have another month or 2 of colder weather here on the east coast so this one is on my list to try. I hope you enjoy the soup, Lisa! Stay warm and have a lovely weekend. Sounds perfect for this weekend! 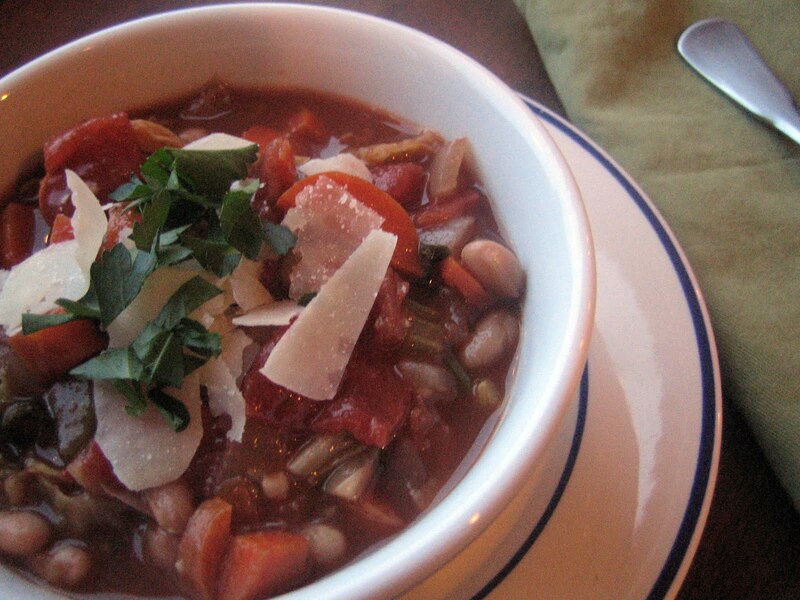 I love a good bean soup; I'm sure this one's amazing, especially with the addition of balsamic vinegar. I hope you enjoy the soup, Lauren - have a wonderful weekend! This looks beautiful! I love soup, too! Thank you, Brooke! I think soup is a perfect winter food to enjoy. I also love soup and this looks just wonderful! I've never thought of adding balsamic vinegar but I bet it gives just the right touch of acidity. Thank you, Katherine! The acidity does complement the beans and veggies and blends well with the tomatoes and wine. This soup was so delicious! Highly recommend! Thanks Hannah! Thank you, Patrick! I'm happy you could join us for dinner. It was a pleasure to spend time with you and Catherine over the weekend. What a fantastic addition to soup! I'll definitely have to try that next time I make a big pot of veggie soup. Thanks! My pleasure, Venessa! I hope you enjoy it.